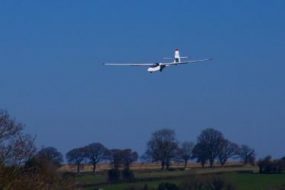 Fifteen members of the Royal Navy Gliding & Soaring Association and Seahawk GC (SGC) took part in an Adventurous Training expedition to the Black Mountain GC, Talgarth, South Wales, to experience ridge and wave soaring, which is not available at any RN gliding club site, in the Black Mountains and Beacon Beacons from Sun 24 to Fri 29 Mar 19. 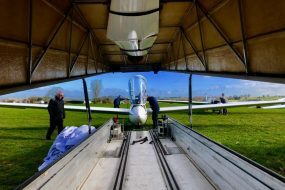 The weather was unseasonably warm for March as a high pressure established itself over the country giving us excellent flying conditions for the whole week. We experienced good ridge and thermal lift plus a little wave conditions as the sun went down for the first 3 days which allowed us to explores the area and achieve a number of duration flights. The last two days were more settled, however, this was perfect for practicing circuits to land to a relatively small sized grass airfield with sloping runways in challenging conditions. All great experience before going cross country and having to land out in a chosen field if ever required! Cdr Barney Wainwright – 1 & 2 hours Bronze Cross Country duration flights plus a field landing. Lt Cdr Paul Callaghan – 2 hours Bronze Cross Country duration flight and Bronze Exam. Mr Nic Barretta – 5 hour Silver Certificate duration flight. 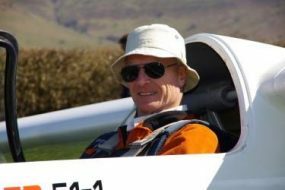 Lt Cdr Rob Dowdell – First solo at Talgarth. Lt Tom Luscombe – First solo at Talgarth. Barney Wainwright said; Brilliant week, many boxes ticked! 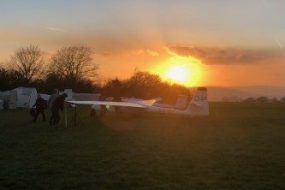 And AET Ben Welsby and S/Lt Dan Parsons both made the most of the opportunity to progress towards solo flight in the near future. 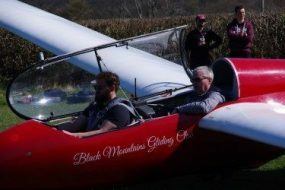 Talgarth is a great soaring site made even better by the warm and friendly reception provided by the Black Mountain Gliding club whose members provided freely of their local knowledge and experience so that we could make the most of the time there. 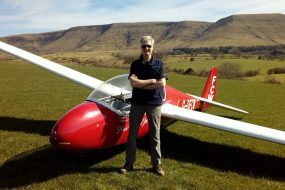 Lt Cdr Chris Bryning, the Expedition Leader said, once again Talgarth has come up trumps, great weather a warm welcome and some outstanding ridge and wave soaring for a bunch of flat lander pilots. We will be back again next year!